If you liked yesterday’s post showing two of the new Colors by Llarowe Tribute to Michael Jackson collection, you will love today’s review! 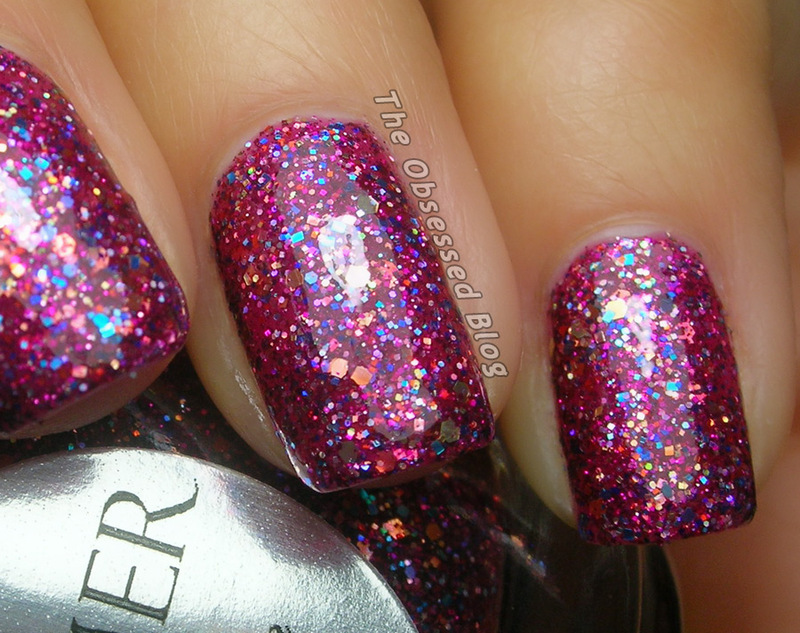 Much like Smooth Criminal, Dirty Diana is another stunning linear holo, this time in a magenta shade. Hot, yet with a slight subtleness to it, Dirty Diana is gorgeous! I used two easy coats for the photos, no top coat. Application, by the way, was a breeze with this perfectly-flowing, self-levelling polish. The tiny glitter in Man in the Mirror is so hard to capture! It is much more holographic and sparkly in real life! SImply gorgeous. I’ll be showing you more of the Tribute to MJ polishes over the coming days! Which of the MJ Tribute polishes is your favourite so far? Today is piCture pOlish Blog Fest 2013, and I am so happy to announce that I was once again able to participate in this world-wide blogger event! 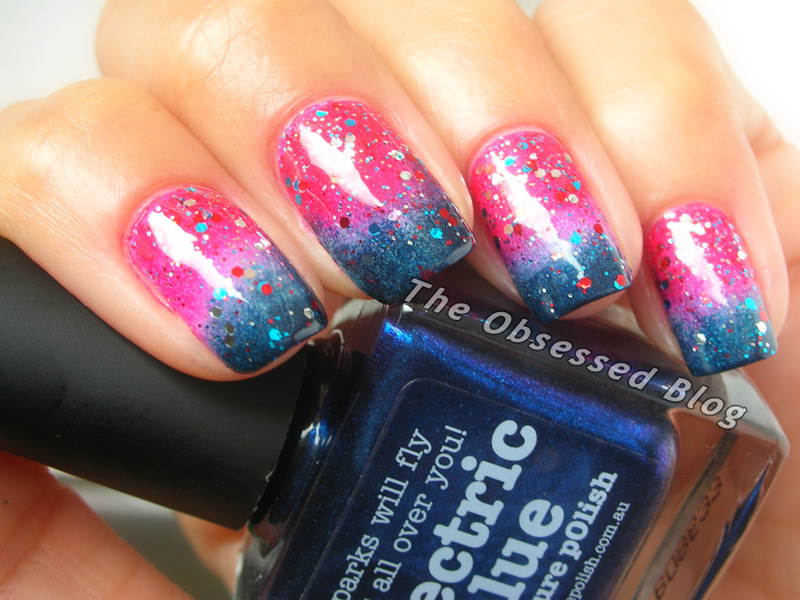 and Ruby Blou, a red, white and blue glitter in a clear base. All Blog Fest 2013 participants will be entered into the Blog Fest Awards to be eligible to win the incredible prize of creating a collaboration shade with piCture pOlish in 2014!!! There will be three winners, voted on by going to the special Pinterest Blog Fest 2013 board, with one voted on by piCture pOlish friends and fans, another voted on by all Blog Fest 2013 participants (bloggers), and a final award as selected by Jules and Megs, the creators of piCture pOlish! How incredible is that! Having recently discovered a knack for (and love of) gradients, I took the risk of using the two bright and contrasting shades of Electric Blue and O’Hara in a sponged-on gradient, with a sparkly finish. 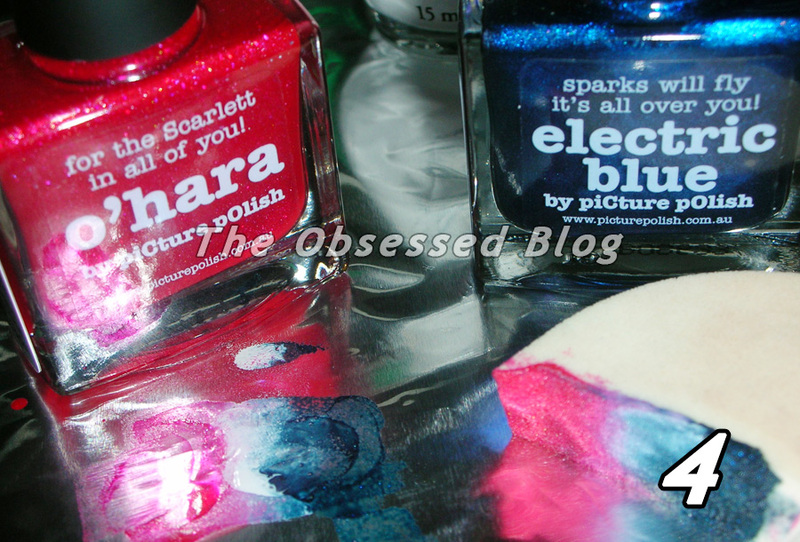 Now let’s look at how I created my piCture pOlish Blog Fest nail art! 4. Once your white coat is dry, you can begin sponging! 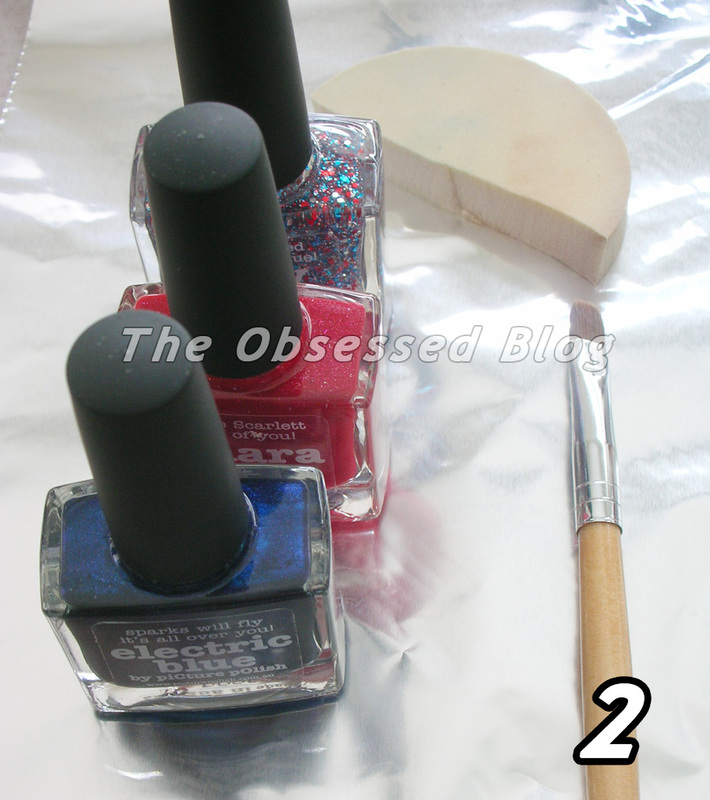 Using your foil work surface, drop your two polish shades (in my case, O’Hara and Electric Blue) side by side, almost touching. To better allow my contrasting colours to fade into each other, I added a drop of white between the two polishes to soften the edges. See photo. You can blend the polish drops into each other slightly by using a toothpick, if you wish. Now gently touch your sponge to the polish, and sponge onto your first nail. You may need to repeat multiple times on one nail in order to fully cover it. 6. Now the clean-up: dip your brush (I like to use a short, firm brush) into nail polish remover, dab on a paper towel to remove excess, and start wiping the edges of your nails and fingers to remove the polish. 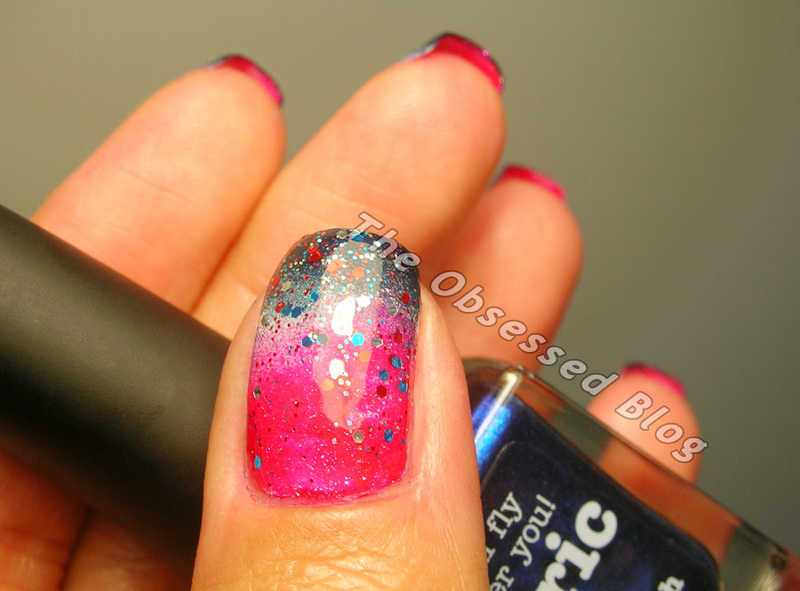 This is the most time-consuming part of a gradient mani, so be patient. Wipe your brush on your paper towel every few wipes to remove any colour, then dip and wipe again. 8. 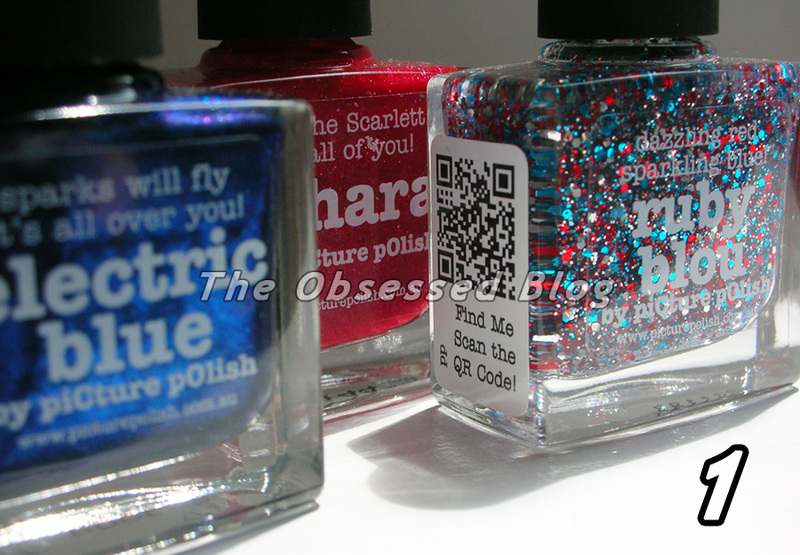 Add your chosen glitter polish, in my case, the spectacular, sparkly Ruby Blou. What do you think of my nail art? Don’t forget to follow piCture pOlish on Facebook, Twitter, Pinterest, and Instagram, and check out their new YouTube channel! To get any of the shades used here (or other piCture pOlish and Ozotic polishes) check out the piCture pOlish Network page. You can also buy direct from them! Check out their Shipping page for more info. And make sure to check out their Everyday Deals page to find daily deals! Feel free to add your Blog Fest 2013 mani to the list and grab the code to add it to your blog! 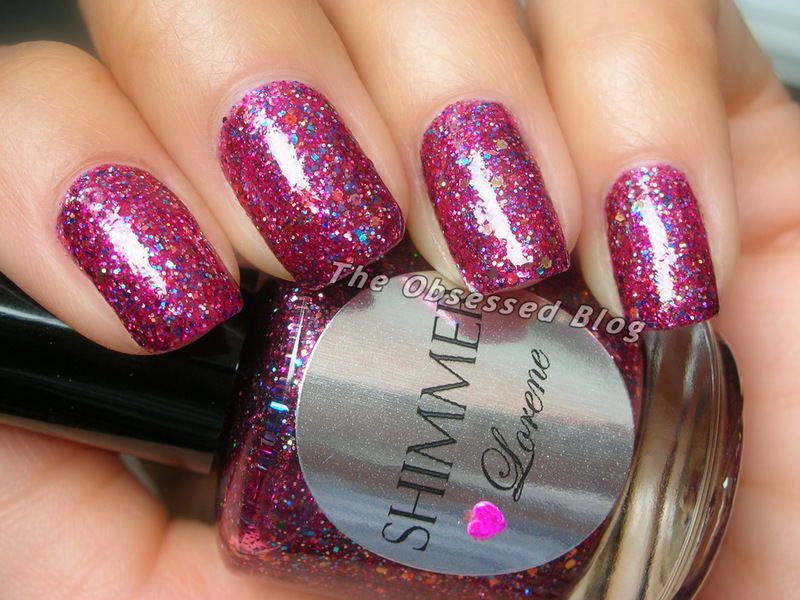 I’m in a bit of a shimmery mood so today I have another gorgeous Shimmer Polish for you: Lorene! This one is described as a “Raspberry Mix” – a perfect description for this berry-coloured polish. 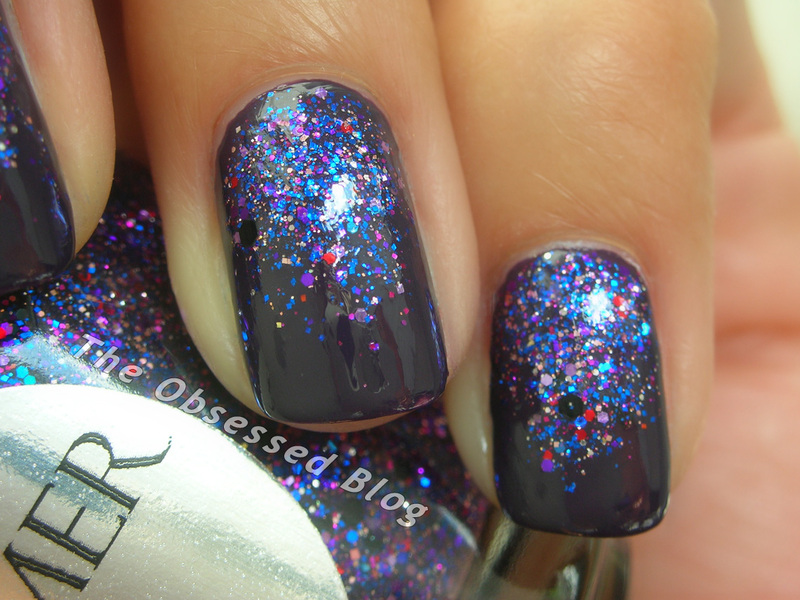 The base is a deep berry colour, filled with tons of multi-hued glitter. The primary glitter colours that stand out are turquoise, magenta and lilac, accented with gold hexes. Like most Shimmers, the jelly base is great for layering, but I really wanted to wear Lorene on its own. Get your very own Shimmer Polish here. Be sure to like them on Facebook to participate in their contests and see more gorgeous photos! Do you own any Shimmers? Taylor is a deep red jelly loaded with tiny shimmers in green, purple and red. Much like some of my favourite vampy Shimmers (see Mary, Karina, Marilyn), Taylor’s gorgeous wine-coloured jelly base allows the glitters to be suspended, seemingly in mid-air (mid-polish? ), creating a jelly-sandwich-in-a-bottle! J’ADORE Taylor!!!!!! I love the contrast of red and purple glitters in this wine-coloured base, colours you normally wouldn’t think to put together. And like most jelly glitters, you can wear Taylor alone or over a base colour, like a black. You can find Shimmer Polish here. Be sure to like them on Facebook to participate in their contests and see more gorgeous photos! So do you love it nearly as much as me? Hope you’re having a great long weekend so far if you’re in Canada! I wanted to share with you a supercute and girly mani today… something simple but perfect for summer! The glitter polish I used was from Candeo Colors, a US-based indie brand that I’ve unfortunately not had a ton of experience with. I have worn only two other Candeos (see them here), both glittery, colourful polishes, and Zef is no different in that aspect. Candeo Zef is a matte glitter polish. It is filled with small black, blue and pink matte hexes, medium pink matte squares and black hexes in a clear base with some matte large blue hex glitters. I simply love pink and black together! Throw in my favourite colour blue… well, this is a gorgeous bottle, let’s put it that way! The base colour I used is one of my recent favourite pinks – Nicole by OPI’s Still into Pink, a truly outstanding hot pink lacquer that is also matte! (You must see this post, if you haven’t yet!) Still into Pink lights up when paired with shiny top coat, and Candeo Zef looked luminescent overtop! Candeo Colors are available on Candeo’s website, and used to be available from Llarowe though I am not sure if she still has Zef. Don’t forget to follow Candeo Colors and Llarowe on Facebook!